Our 2019 Family Fun Day is booked for February 9th 10am-12pm at the Reagan House (Scout Valley) in Orillia. Past and present clients welcome. Bring a sled and outdoor clothes. Light refreshments provided. View our most recent newsletter and find out about upcoming family events and activities here in Orillia. If you are interested in any of our events, please contact mel@orilliamidwives.com to sign up, or for more information. We invite all families to join us for our annual family picnic! This years event will be better than ever with games and crafts for kids; a provided lunch and desert; and a baby gear swap table. 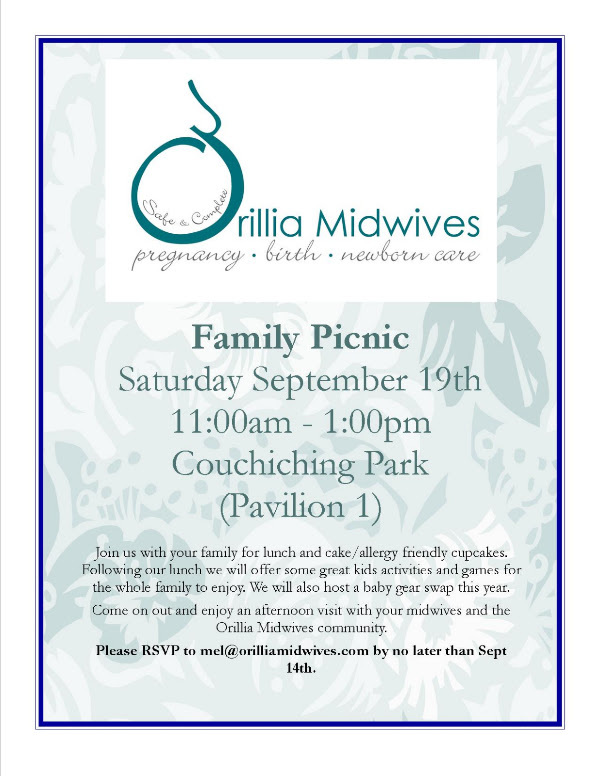 In order to properly prepare for the event we ask that families RSVP to mel@orilliamidwives.com as soon as possible but no later than September 14th. We want to ensure that we have adequate food prepared and materials available for crafts. When you RSVP, please let us know how many people from your family will be attending and if you have children, their ages. ALL ARE WELCOME AND ENCOURAGED TO ATTEND! Parking for our clients is available in public lots behind our clinic or adjacent to City Hall. Please do not park in spaces reserved for our staff or the Shoppers Home Health Care customer spaces. Please let us know if you plan to drop in Thursday evenings as often the door is locked after dark. It is never to early or late to call or email Orillia Midwives. You can make an appointment, even if its just to talk.